AUGUSTA — The Maine Bureau of Veterans’ Services is accepting applications for the 2019 Disabled Veterans Controlled Moose Hunt, held annually on farmland specified by Maine Department of Inland Fisheries & Wildlife. Since the program’s inception in 2010, MBVS has partnered with IF&W and Smoldering Lake Outfitters to issue hunting permits and essential equipment to participating veterans. This year, IF&W has allocated moose hunting permits for disabled veterans who are residents of Maine — and a small group of non-resident disabled veterans — to participate in the Disabled Veterans Controlled Moose Hunt. 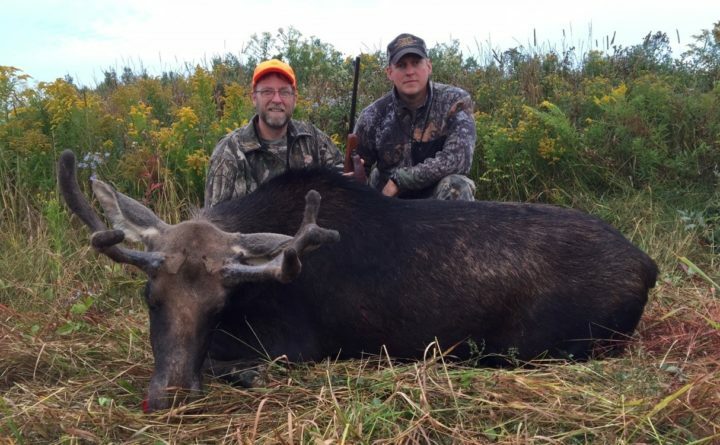 This hunt is not the same as the regular IF&W moose lottery, as it requires each hunter to team up with a registered Maine Guide who has specific training for the Controlled Moose Hunt and is open only to veterans with a disability rating of at least 50 percent. If a veteran has ever tagged a moose through the Disabled Veterans Controlled Moose Hunt, they are ineligible to hunt again. This year, there will be three hunts in August and two in September. The hunt, which is entirely free for selected veterans, costs $50,000 to administer and is funded entirely through donations and sponsorships from local businesses, organizations and individuals. In order to continue providing this program for veterans at no cost, the public is encouraged to donate or sponsor the program. All funds raised go toward covering costs associated with the hunt, including hunting guide services, essential adaptive equipment, meat processing, and travel & lodging for participants. For related questions, please contact Sarah Sherman at sarah.sherman@maine.gov or (207) 430-5816. Applications must be submitted by mail or email to the Maine Bureau of Veterans’ Services, 117 State House Station, Augusta, ME 04333 or mainebvs@maine.gov by 4 p.m. on Friday, May 3. Application forms can be downloaded from the Bureau’s website at www.maine.gov/veterans. Results of the lottery will be posted no earlier than Friday, May 24. For information on the Maine Bureau of Veterans’ Services and the Disabled Veterans Controlled Moose Hunt, visit: http://maine.gov/veterans/ or call 207-430-6035. The Maine Bureau of Veterans’ Services was established in 1947 by the State of Maine and is part of the Maine Department of Defense, Veterans and Emergency Management. Our mission is to help Mainers who served, and their loved ones, understand and navigate the benefits, services, and programs available to them. The Bureau does this by being a responsive, experienced, and dedicated advocate. The Bureau is headquartered at Camp Keyes and has seven field service offices located throughout the state and a claims office located at the U.S. Department of Veterans Affairs, Togus, Maine. The Bureau also operates the Maine Veterans Memorial Cemetery System which includes four veterans’ cemeteries. For more information about the Bureau or to request assistance, please visit our website at www.maine.gov/veterans.